Why stay cooped up indoors? With today’s hustle and bustle, an outdoor living space brings the family back home to your very own backyard destination! Enjoy your very own “Stay-cation”! 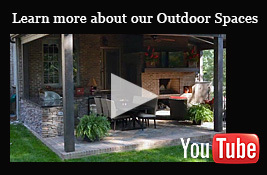 An outdoor living space is one of the least expensive ways to add living space to your home. Limitless combinations of colors and shapes to compliment any architectural style or region. An outdoor living space can compliment any home by creating a new space, or by complimenting your already existing spaces like decks, pools and other structures. An outdoor living space built with the quality and beauty of pavers extends the quality and standards you expect of your home. Paver living spaces require little to no maintenance, and are the most cost effective way to ensure getting the most bang for your buck. Pavers survive freeze-thaw cycles better without cracks, material loss and degeneration over time. Pavers are less brittle and less likely to be damaged by dragging or moving patio furniture around, than on concrete and pressed concrete patios. Paver patios resist stains and are easier to clean and maintain than concrete and other patio surfaces. Bring the enjoyment of an outdoor kitchen to your living space! Stay outdoors and enjoy your time with your family, not watching from the indoor kitchen window! (Utilize provided pics) Does this all to familiar scene reside in YOUR backyard? We’re willing to bet once installed, your outdoor space will become your favorite room in the house! An investment in pavers is an investment in the peace of mind that you’ll enjoy the same beautiful patio and space year after year! Concrete and other paved surfaces do not offer that same peace of mind. The colors, textures and ambience pavers bring to your outdoor space takes your entertaining and enjoyment to a whole new atmosphere! 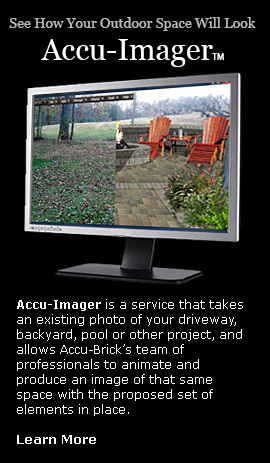 Remember to ask your Accu-Brick representative if an overlay option is available for existing space.